When you recycle a scrap car, you might think it is just melted down ready to be reused, but it’s a little more complicated than that. If your mental image of scrapping a car is of your faithful old vehicle lowering Terminator-style into a vat of molten metal, one thumb raised in salute as it vanishes below the surface, then you might be surprised by how many stages are actually involved. 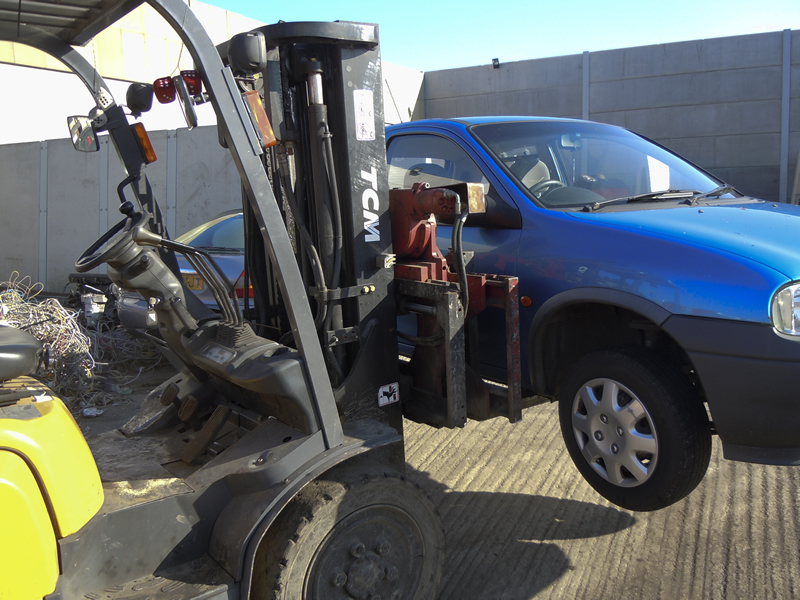 A vehicle contains a fairly large selection of different fluids, from engine oil and petrol, to antifreeze and hydraulic fluids – and these must be removed before the solid materials can be recycled. Where the containers for these fluids can be opened, they can be drained relatively easily, while any fluids sealed inside components may be released by drilling an escape hole. Certain parts of your car may still be usable, and where they can be recovered for spare parts, it can make good environmental sense to do so. The wheels are prime candidates for this, as they can be relatively easy to remove intact, and there is always strong demand for replacement tyres. Batteries can also be removed to be reused or safely recycled, due to the potentially hazardous material contained within them that cannot simply be drained away. In many cases, the engine is lifted out of the vehicle – again, if it is in good condition, it may be possible to directly reuse this elsewhere. Even if it has seized up, been damaged in a crash or has otherwise stopped working, the engine may still be removed for separate recycling. Once any useful parts have been removed, the empty body shell is left, and this is finally the moment to crush the car into a compact cube. This means it requires less storage space until the metal itself can be melted down and recycled, and can make it easier to move the cube, rather than trying to transport the shell still in the shape of a car. A car can be a best friend for many enthusiastic motorists, and saying goodbye can be a genuine ordeal – there’s no shame in that. But when you recycle your car, at least you can draw some comfort from the fact that parts of it will go on to be used in other vehicles, while the raw materials will also find a new life elsewhere, in one form or another.